Digitally remastered with new lyrics! 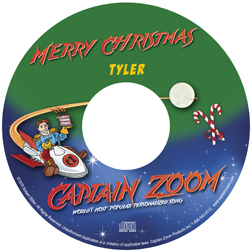 A novel gift for the holidays, this personalized song with a Christmas message from Captain Zoom®, is perfect for that wonderful boy or girl. They will love and listen to this Christmas gift all year long. 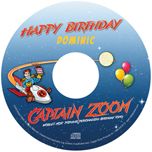 Captain Zoom sings the child’s name 8 times! Search Tips: To avoid scrolling, place the cursor in the drop-down list and type the first letter of the name. To order a product, select the name from the drop down list and add to cart. Check the phonetic pronunciation and different spelling options. For example, Anna can sound like “An-uh or Ah-nuh.” See instructions below if you can't find a name. 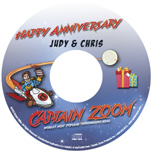 The song is to the tune of the timeless Captain Zoom personalized birthday song but with lyrics for the Christmas season. Can't find a name? Have a different spelling? Try searching the entire list. The name you are looking for may be under a different spelling. For example, there are many different ways to spell Aubrey. It might be listed as Aubrey, Aubrie, Aubry, etc. You can modify the spelling of any of the names. 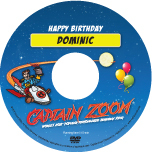 If you are still unable to find the person’s name, click to order a custom name for $12.00 extra. Please use our A-Z Name List as reference or contact us at 1-800-543-9112 for assistance. Follow Us. Stay in touch. Check out our Facebook, Twitter, and LinkedIn pages. 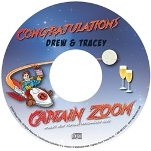 ©1976-2014 Captain Zoom Products, Inc. All Rights Reserved.